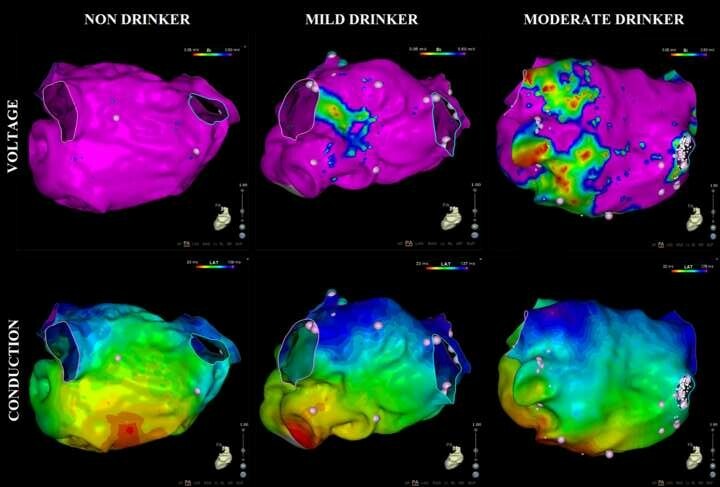 Representative high-density voltage (top panel) and propagation maps (bottom panel) of the posterior left atrium for non-drinkers, mild drinkers, and moderate drinkers. The moderate drinker has more scarring evident. The article is “Moderate alcohol consumption is associated with atrial electrical and structural changes: Insights from high-density left atrial electroanatomic mapping,” by Aleksandr Voskoboinik, MBBS, Geoffrey Wong, MBBS, Geoff Lee ,MBChB, PhD, Chrishan Nalliah, MBBS, Joshua Hawson, MBBS, Sandeep Prabhu, MBBS, Hariharan Sugumar, MBBS, Liang-Han Ling, MBBS, PhD, Alex McLellan, MBBS, PhD, Joseph Morton, MBBS, PhD, Jonathan M. Kalman, MBBS, PhD, FHRS, and Peter M. Kistler, MBBS, PhD, FHRS (https://doi.org/10.1016/j.hrthm.2018.10.041). It will appear in HeartRhythm, volume 16, issue 2 (February 2019) published by Elsevier. Full text of this article is available to credentialed journalists upon request; contact Jane Grochowski at +1 406 542 8397 or hmsmedia@elsevier.com. Journalists wishing to interview the authors should contact Professor Peter Kistler at peter.kistler@baker.edu.au.